Summary: Dr. Kay Scarpetta is working a highly suspicious death scene in a historic home in Cambridge, Massachusetts, when an emergency alert sounds on her phone. A video link lands in her text messages, immediately begins playing...and it seems to be from her niece Lucy. But how can it be? It's clearly a surveillance film of Lucy taken almost twenty years ago. As Scarpetta watches she comes to grips with frightening secrets about her niece, whom she loves like a daughter. That first clip and others sent soon after raise dangerous implications that increasingly isolate Scarpetta and leave her confused, alarmed, and not knowing where to turn. She doesn't know whom she can tell - not her FBI agent husband, Benton Wesley, or her investigative partner, Pete Marino. Not even Lucy. 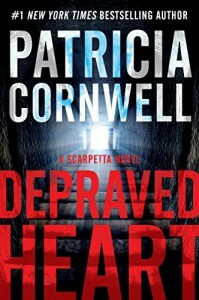 Cornwell launched these unforgettable characters on an intensely psychological odyssey that includes the bizarre death of a Hollywood mogul's daughter, wreckage on the bottom of the sea in the Bermuda Triangle, a grisly gift left in the back of a crime scene truck, and videos from the past that threaten to destroy Scarpetta's entire world and everyone she loves. The diabolical presence and singularly "depraved heart" behind what unfolds seems obvious - but strangely, not to the FBI. Certainly that's the message they send when they start harassing Lucy and begin building a case that could send her to prison for the rest of her life. In the latest novel in her bestselling series featuring medical examiner, Dr. Kay Scarpetta, Cornwell captivates readers again with the jolting twists, high-wire tension, and cutting-edge forensic detail for which she is renowned, proving yet again why she is the world's number one bestselling crime writer. - Harper Collins, 2015. Depraved Heart is the first Scarpetta novel I've ever read. I had no knowledge of the novels or the characters beforehand, but, as always, I'm willing to take a chance to enter a series mid-way through. Unfortunately, this was another poor choice. Scarpetta is facing the "ghost" of her archenemy and is forced to go on a wild goose chase to figure out why her niece has been targeted by the FBI. The focus on the enemy was too much - Scarpetta is a paranoid mess and I was exasperated before I was even half-way through the book. I think Scarpetta described how out of control they were about six-hundred times. Geez, I get it, you're dancing to her tune and she's so~ perfect at being evil and everything is out of your hands. Stop saying the same thing twenty times per chapter. I didn't like any of the characters. I felt no tension or suspense because I was too frustrated by how poor the plot was. Cornwell is focusing so much on the archnemesis that she completely loses control on the original mystery she introduces in the book. It only barely ties into the archenemy plot and I don't think you can even really say it was "solved". This is a 466 page hardcover and the entire plot takes place in over twelve hours. I feel like the book could've been cut in half and Cornwell still could've accomplished her plot goals. After this, I'm extremely hesitant to pick up another Scarpetta novel. I also did research on this novel and it looks like even the longtime fans of the Scarpetta novels didn't like this one either. I honestly can't recommend this book to anyone. I give Depraved Heart a C-. If you're going to read this book, please borrow it from a friend or your local library or buy it.